This is page 50, the halfway mark of Chapter Zero! Now let’s get into it! Hooray for the halfway mark! Poor Derk. He hasn’t seen much action in a while. Just kinda along for the ride. Haha, me and Victor were just talking today about how Derk hasn’t said anything in a while. I’m sure he’ll get his chance to shine soon! We do not, unfortunately! Currently I have enough trouble balancing regular comic updates with everything else in life, let alone bonus rewards for people who donate. But maybe someday that will be more feasible! But if you want a cameo in the comic, check out the “rewards” tab up top! Don’t worry, we can fix him! …I think… too bad Lorelei isn’t around yet. It says a lot of things. Sticks and stone may break my bones, but words will make me WARGH! Sticks and stones may break my bones, but words will break my face. Curses, it’s the answer to everything! Oh Skärva you seem to be especially sensitive on the subject of curses. Can’t possibly understand why. And now: Curses ™ are available for villainous minions and their descendants too! You can never have too many curses! Also! I really like the background texture behind Veronika in the 4th panel. He’s a curse hipster. His family had a curse before they were trendy. I bet Bladud isn’t dead. 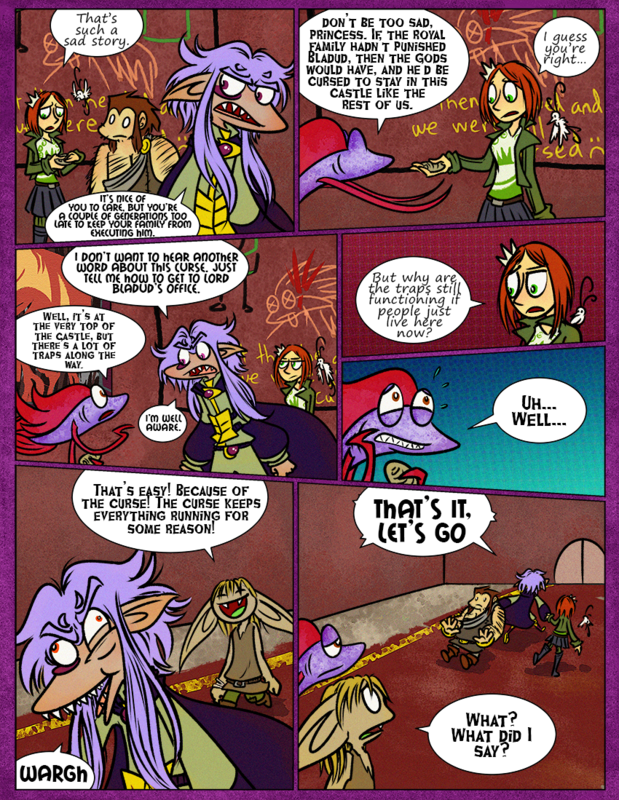 I’m very excited to see where this is going, and I love how unimpressed Skaerva is with the whole thing. “floating castles – hah!” or WARGH in this case. “WARGH” is the noise Skarva makes when he tries to hold in an Orange Fury like you do a sneeze. You can see it in his eyes; literally, they change color. His full name is Tiberius Skarva Barnehageforening!